Public Health Minister Jane Ellison: "This is a bold step"
During the debate, ministers said the technique was "light at the end of a dark tunnel" for families. Proponents said the backing was "good news for progressive medicine". Critics say they will continue to fight against the technique that they say raises too many ethical and safety concerns. The technique, which was developed in Newcastle, should help women like Sharon Bernardi, from Sunderland, who lost all seven of her children to mitochondrial disease. Mitochondria are the tiny compartments inside nearly every cell of the body that convert food into useable energy. They have their own DNA which does not affect characteristics such as appearance. 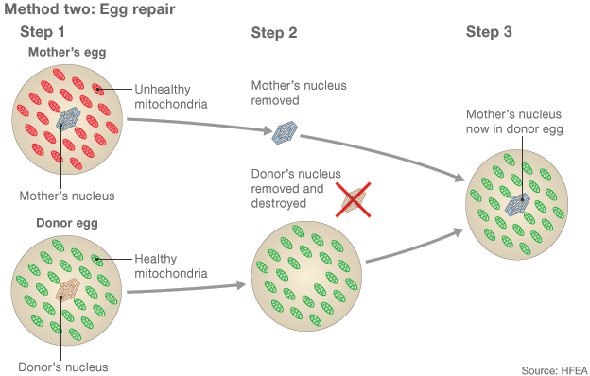 Defective mitochondria, which are passed down only from the mother, lead to brain damage, muscle wasting, heart failure and blindness. In the Commons debate, Public Health Minister Jane Ellison told the House: "This is a bold step for parliament to take, but it is a considered and informed step. "This is world leading science within a highly respected regulatory regime. "And for the many families affected, this is light at the end of a very dark tunnel." Fiona Bruce, the MP for Congleton, countered: "[This] will be passed down generations, the implications of this simply cannot be predicted. "But one thing is for sure, once this alteration has taken place, as someone has said, once the gene is out of the bottle, once these procedures that we're asked to authorise today go ahead, there will be no going back for society." The debate in Commons also repeatedly struggled with whether the move would constitute "genetic modification". Robert Flello, who represents Stoke-on-Trent South, said he feared "families will be let down tragically" due to the uncertainties in the technique and that society would be "up in arms" if this was genetically modified crops. But Frank Dobson, a former former health secretary, argued uncertainty was "the nature of medicine and science" and that IVF would not have gone ahead if absolute certainty was needed. Last week the Catholic and Anglican Churches in England said the idea was not safe or ethical, not least because it involved the destruction of embryos. Other groups, including Human Genetics Alert, say the move would open the door to further genetic modification of children in the future - so-called designer babies, genetically modified for beauty, intelligence or to be free of disease. David King, from the campaign group, said: "Once you cross the ethical line, it is very hard not to take the next step of designer babies." Dr Gillian Lockwood, a reproductive ethicist, told the BBC it was a "small change" in the legislation. "The biggest problem is that this has been described as three-parent IVF. In fact it is 2.001-parent IVF," she said. "Less than a tenth of one per cent of the genome is actually going to be affected. It is not part of what makes us genetically who we are. "It doesn't affect height, eye colour, intelligence, musicality." A review by the Nuffield Council on Bioethics, as well as a public consultation by the fertility regulator, argued the creation of three-person babies was ethical. Three scientific reviews by the Human Fertilisation and Embryology Authority (HFEA) suggest the technique is "not unsafe". Yet some scientists argue those reviews were flawed. Dr Ted Morrow, from the University of Sussex, believes there are still uncertainties. "I have some concerns about the safety, I'm really not happy that the reviews have been as exemplary as other people think they are." Prof Lisa Jardine, former chair of the HFEA, said the safety issue was a "red herring". "All of those issues have been investigated," she said. "The scientific committees have said there is no evidence this procedure is unsafe but like all good scientists, they say it will require careful progress." Bishop of Swindon Dr Lee Rayfield said this procedure was a "massive step" and some of his colleagues were concerned about how it was going to be regulated once approved. "If the safeguards are there, the Church of England will be behind this," he added. 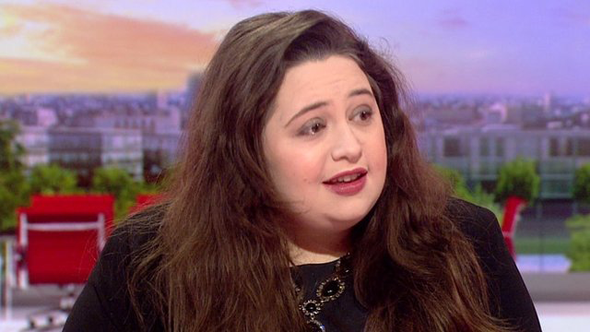 Rachel Kean, whose aunt died from mitochondrial disease, told BBC Breakfast that a yes vote would "prevent some of the cruellest and most devastating diseases, not just for the next generation but generations after". She said there had been an "unprecedented" amount of scrutiny into the regulation and a lot of misinformation about "designer babies". If politicians vote it through, then the HFEA is expected to give Newcastle a licence to carry out the procedure. The first attempt could take place this year, which could lead to the first birth in 2016.